Now you can evaluate your leadership capability in some of the most sought-after executive-level skill sets for today’s business environment. 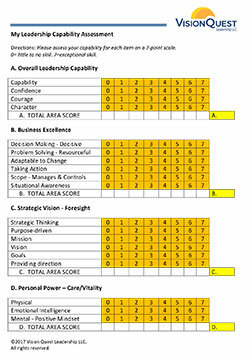 Our 40-item assessment generates a comprehensive view of your current level of leadership proficiency in several key areas. Follow the instructions provided for scoring your assessment. After scoring your assessment, please contact us to discuss. 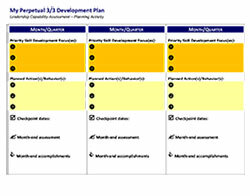 We will answer questions, help you interpret the assessment, and walk you through the use of the planning tool. How can you best tap into your strengths? How do you plan to address areas of opportunity for growth and development? How might you minimize or transform potential derailleurs? We’re eager to help you perform at your best. We have broad experience and valuable insight to share.